FAQ — Your Creative Connection, Inc.
What does the Your Creative Connection logo signify? The circle represents being inclusive, whole, and united. The number 8 symbolizes balance and harmony. The butterfly is symbolic of transformation, moving through life cycles, lightness of being, and the world of the soul. A gathering of butterflies is referred to as a kaleidoscope. Kaleidoscopes supply the viewer with an expanded, colorful way of seeing the world around them. The color wheel is a reminder of the infinite possibilities when we combine basic elements in different ways. Our aim is to offer events that provide a truly enriching experience in all of these areas. Yes! From your private accommodations with en suite bathroom and fresh linens to an array of exciting evening activities, plus: all meals, afternoon snacks, daily beverage service (water, coffee, and tea), and creative surprises every day. Aside from your travel to and from this magical gathering, everything you need is included! Of course, you may bring your favorite, must-have art supplies, but everything you'll need to fully participate in all three, full-day Studio Sessions is included in the cost of your registration. The chefs at Haw River have you covered. We ask about food sensitivities on the Registration Form, and we will inform them of your needs. Are payment plans still available? The earlier you register, the more options you'll have for breaking up your payments. You'll find the currently available options on our Registration Form. If you cancel your registration within 7 days of the date of your deposit, you will receive a 100% refund. If you cancel your registration between 8 and 59 days of the date of your deposit, you will receive a refund of the amount you have paid, less a $100 administration charge. If you must cancel your fully paid registration for Your Creative Connection - Haw River 2018 after August 15th, we will allow you to transfer your space to someone else. You are responsible for obtaining payment from that person. Registration for Your Creative Connection - Haw River 2018 closes on September 30, 2018 or when all spots are filled, whichever occurs first. Once an event is full, we will start a Wait List. Should a spot become available, we will contact individuals from the Wait List in the order in which they were added. The main walkways between facilities at Haw River State Park are paved. There is a gentle grade between the lodgings and our Studio space. We will offer transport to and from the Studio for folks who need it. If you enjoy walking, plan to bring comfy shoes and take advantage of the beautiful trails that wind throughout the park. Will I be able to choose a roommate? If you would like to share the private room included in your registration, you certainly may! You and your chosen roommate should each name the other on your registration forms to ensure correct pairing. Will there be a "what to pack" list? Yes. As we get closer to October, we'll publish a list of suggestions for registered Creative Explorers, but remember, you won't be weighed down with art supplies; they're all included! How do I get to the Haw River State Park? Haw River State Park is located at: 339 Conference Center Dr, Browns Summit, NC 27214. For detailed directions click on address above and select "Directions" (white circle in upper left hand side of screen) to format driving directions from your location. 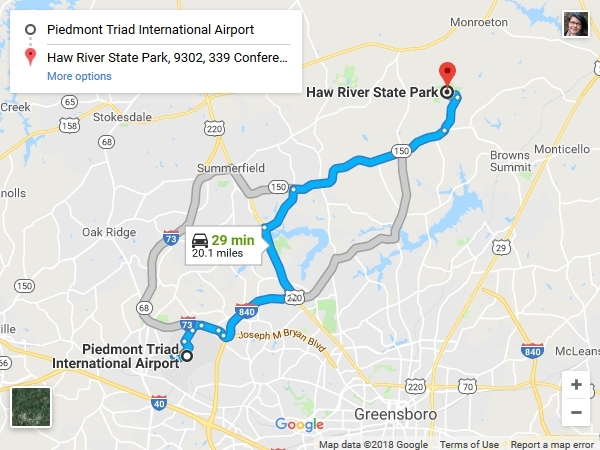 If you are flying: The closest airport is Piedmont Triad International Airport. It is only 30 minutes from our venue. For driving directions from the airport, click on the map below. If you have any questions or concerns about the best way to get to Your Creative Connection - Haw River 2018 please contact us. We are happy to offer assistance in any way possible. May I bring a guest, and is there a minimum age requirement? Everyone at the event must be registered, and we request that all Creative Explorers be at least 18 years of age. If you would prefer to speak by phone, please include your telephone number and the best time to reach you in your message.